Why have I never heard of this goddess before? I've been familiar with Thoth, her consort, since I read The Tales of Ancient Egypt by Roger Lancelyn Green (the classic Puffin edition) at junior school, but I don't recall ever coming across Seshat, with the odd seven pointed thing hovering over her head, before. And she's really very interesting - her name means "she who is the scribe", and she is often depicted inscribing the years of a pharaoh's reign on a palm leaf rib. She was the goddess of wisdom, writing and mathematics, which also included astronomy, architecture and surveying, and building (for which accurate mathematics was required). Knowledge of history was another of her attributes. She recorded the spoils of war, and the speeches of the pharaohs, and was part of the ceremony of "stretching the cord", the surveying tool which was used for accurate measurement in building, and symbol of the power of the pharaoh. As a funerary goddess, she kept the memory of the dead alive by writing an account of their lives. She was also known as Mistress of the House of Books - her priests oversaw the library, and she was supposed to look after the library of heaven. 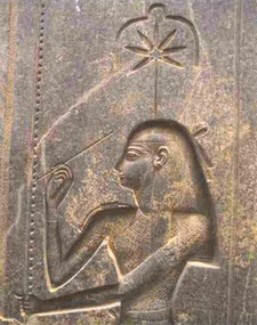 In Spell 10 of the Coffin Texts, it says: "Seshat opens the door of heaven for you." Sounds like a library to me! Though it could also refer to her astronomical attributes. Sadly, she doesn't seem to have a temple in her honour, though I suppose any library would fulfill that role. She is usually shown wearing a leopard skin, or a dress spotted like a leopard skin - symbolic of the stars and night sky.